I wrote a review of Divine Right of Kings, the debut album by Babylon Mystery Orchestra not long after I have started with this site. Even though it has been a while, my memory held on to the reaction the album stirred in me. After the review was posted, Sidney Allen Johnson, the man behind BMO, and I got engaged in an interesting philosophical and musical discussion. The opinions were exchanged, but I doubt we could influence each other’s vision of music and the world in general. I also doubt I made the list of Mr. Johnson’s favorite music critics as he elected not to publish my review of Divine Right of Kings on his site. The truth is, no matter how much different we are, I have a tremendous amount of respect for Mr. Johnson. He has his own formed strong outlook that he is not afraid to display and defend. I would love to have him at my dinner table to engage in hours-long all-encompassing conversation, but his third installment The Great Apostasy: a Conspiracy of Satanic Christianity is still not turning Sidney Allen into one of my favorite composers. I have missed one of BMO’s albums in between the debut and The Great Apostasy, but I can see that little has changed from Divine Right of Kings. Mr. Johnson is still the lonesome musician perpetuating his way of making rock albums. This method behind Babylon Mystery Orchestra amounts to playing a rhythmically simple version of dark gothic rock augmented with Sidney Allen’s monotonous monochrome vocals. Sisters of Mercy and Type O Negative references are quite obvious at times (Church of State and Wolf in the Fold). I still do not quite take pleasure from BMO songs powerchording their way through while latched on to the never-changing rhythmic pattern (Holy Ghost, Prey for Me, King of the Earth). 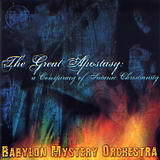 On The Great Apostasy, the album dealing with role and evolution of religion, as influenced by the character of Lucifer, BMO managed to capture well the atmosphere of a dark damp monastery, the hidden-away-from-human-eyes temple, but the variety, or actually lack thereof, between songs is still lagging. There is more synth and guitar hidden undertones needing exploration on The Great Apostasy. One Way, One Truth, One Life and Eye of the Needle tend to make a little anthemic splash, but just like before I was laboring to get through the album musically. I, Lucifer is an interesting Spanish style electroacoustic instrumental, and the energetic riffs of the closer Antichrist Superczar, along with the closing symphonic outro, simply do not make up for the rest of the album proceeding at the same repetitive pace. With BMO things rarely change once they hit the groove. Sidney Allen’s vocals obviously do not help matters. These are spoken chants more than anything else, relaying the deep message hidden in the album’s lyrics, but they certainly translate little in the way of melody. Just like before, the author/singer tends to repeat certain lyrics phrases so many times, most notably in Prey for Me and Wolf in the Fold, the intended hypnotic effect starts turning into annoying. A believer himself, Mr. Johnson certainly presents an interesting one man’s opinion of how organized religion is serving the interests of dark forces much more than it was called to represent the sacrifice of the God’s son. It is hard to argue with Sidney Allen that organized religion have corrupted the purity and belief meant to sustain original Faith. The booklet is beautifully laid out, full with quotes about religion by many bright minds and influential members of the humanity, as well as excerpts from the Bible. I have studied this booklet for at least an hour, finding great enjoyment in the wisdoms expressed within. As I said before, I would really enjoy Mr. Johnson’s philosophical essay, fiction or even a comic book, but he wants to express himself as a musical artist, and his musical style is where we can’t bridge the gap. I would dare to give the album a quote this time, as I knew what to expect and wasn’t caught by surprise as much, but I’d still encourage you to do your own research trying to understand Babylon Mystery Orchestra.